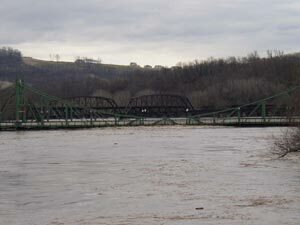 For the second time in less than a year, the Delaware River has flooded Easton, Pa. While my house is ok — we live in College Hill, which overlooks the Delaware — downtown isn’t nearly so lucky. Route 611 is under water. Larry Holmes Drive in downtown Easton is underwater. Plenty of businesses along that road are also partially submerged. And the free bridge? Well, as you can see in the photo accompanying this story, the water is slapping up against its sides. Hopefully it won’t get hit by a house this time (as it did back in September). Driving into work this morning, I was astounded to see the flooding was even worse than last time around. Yes, I knew from reading the news that it was going to be bad, but until you actually see it, well, words fail me (or more likely, I fail the words).